Your feet may stick to the floor at New Cross Inn but pool tables and live music? It's the closest we've got to being in the movie Road House. Live music is one good reason you should visit. About: Here at the New Cross Inn we put on live music 6 nights a week. From Tuesday to Sunday you can check out big bands, small bands, medium – sized bands and sometimes really famous bands playing all kinds of genres. We like to mix it up, so the only criteria we have when we’re booking is that it sounds fantastic. New Cross Inn is not just about music, we also have a weekly quiz night (Mondays), Pool Table (Every Day) and serve excellent alcohol at a decent price. That decent price that gets even more decent during our happy hour (6pm – 7pm every weekday) and if you make it here before 8pm then its 20% off all booze… Happy Days! "Live music is one good reason you should visit." ‘Yikes!’ is quite likely to be the first thing you think on arriving at New Cross Inn and that’s not just because this is a pub that used picnic tables as its inside seating – although that’s probably part of it. You’ve seen dives before but then you see New Cross Inn, as the true nature of the word becomes apparent. 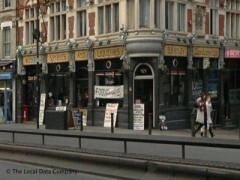 But is there anything wrong with that, a pub shaking it all off to show its true nature, its grimy, grimy nature? When that pub doubles up as the most infamous live music venue in the whole of New Cross, we see nothing wrong at all. Featuring a stage on one side, a bar with raised DJ booth perched above it on the other and nothing much but a pool table and those classy picnic benches in between, it’s safe to say that New Cross Inn leans more towards the live music side than the ‘relax a while with a pint and a good book’ side. And don’t we need all the places like that we can get? We sure do. The bar serves up Sam Adams lager for the connoisseurs alongside the usual beers and spirits but stands out as being one of the only pubs pretty much anywhere that has a pool table these days. If you miss the days of putting a pound coin on the table and staking your claim to a game – and who doesn’t – then rock out at the New Cross Inn sometime. Live music here is genuinely good and the nights are often interesting, plus it’s always good to take a break from the Amersham down the road.